This is not a blog post about a 3-step system on how to find the perfect composition in a painting every time. I don’t believe such a system or mathematical formula exists – at least not for plein air or from-life painting. Composition or Design in a painting is one of the hotly debated principles of art. Opinions range far and wide and are often resolute and insistent in the supremacy of those ideas. I don’t intend to refute any of the theories because most of them are useful at one moment or another. I also will not describe any of them in detail because I rarely think about any of them when I’m painting. What I will discuss are a couple of my paintings and what compositional or design principles guided me – like in Morrow’s Meadow that I painted on location and finished in the studio. Design I feel is a much better word than composition to describe how I arrange my paintings. Contrasting values and color temperatures, hidden and obvious lines and hard and soft edges all combine to lead the viewer and contribute to the design. All of that is coupled with varied sizes and placements of shapes and objects. Each of these elements become part of the design. There are some handy books and theories that I have studied that cover in-depth the principles of composition. Two that stand out are Edgar Payne’s Composition of Outdoor Painting and Cezanne’s Composition by Erle Loran. Of course, we can’t leave out Richard Schmid’s Alla Prima Book. Books that describe the principles of composition or design in painting. For those who want to learn the terms and details of composition, these are excellent sources. Years ago, I also studied extensively Euclid’s Golden Mean, Dynamic Symmetry and other systems. One of those is the Rule of Thirds – dividing the picture plane with two (or 4) lines – one horizontal about a third up or down the picture plane and one vertical with the same third placement – to make sure the spot where they converge is the focal point (or that the painting is divided by thirds). Some artists insist that the Golden Mean is the only valid and perfect system existing in the universe. What I have found is that most of the debate just gives me a headache – and I’m not prone to headaches. It’s a fantastic idea to study the theories and the feelings they bring to a painting – and then let them settle into the shadows of our minds. Because when we step in front of our easels while plein air painting all those theories are swallowed up by the beauty we see in front of us. The landscape will often show us what to do. Each painting is a new puzzle with thousands of intuitive decisions that will guide the final design. Our quest is to decide what we want to share with our viewers and the most impactful way of doing that. Just like with any of the principles of art, the more we know and the greater our skills the more likely we are to consistently touch the hearts of others with our paintings. That’s why having a working knowledge of the theories of successful design are helpful. When we’re in the trenches though, it’s our instincts about what is working and not working that matter most. I know how you feel. And so does every master painter who has embarked on this life-long quest to create something meaningful. Look at this painting I saw recently by Bob Kuhn, one of my favorite artists. At first, I thought it had to be by another artist, because, well, Bob Kuhn is amazing. So, what are your thoughts about this piece? Does anything bother you? For me I have a hard time knowing exactly what is happening. It feels like the smaller deer is balancing the larger one on his antlers. I believe that the bigger deer is closer to us because of the size relationship. But at first glance it feels awkward because it looks like the larger buck is jumping over the smaller one, rather than jumping while being much closer to the viewer. My mind has to do a double-take to convince myself otherwise. Also, that bright golden line near the bottom of the painting feels like it should be broken up more. And the tall fence of grass behind the deer does little to shine the spotlight on the center of interest and is basically unremarkable. Maybe if a third deer were added. 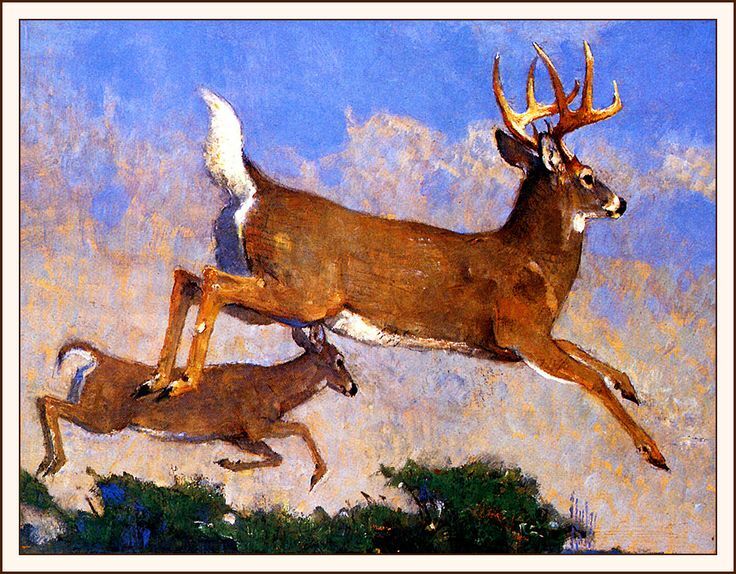 What if the smaller deer had his head down eating or was turned slightly away from the viewer like in this other painting by Bob Kuhn. Here both deer feel natural in their positions and sizes relative to one another. Possibly that is because the smaller deer is not directly under but offset to the left. With the overlap in two places it also pushes the smaller deer firmly back behind. Both deer in motion helps tie them together as well. Notice in Flat Out, the coyote feels completely natural chasing a huge rabbit. We have no problem placing the coyote in the distance and realizing the size difference comes from that spatial relationship, not from actual side-by-side proportions. Kuhn adds to the drama with strategic diagonal lines that contribute to the feeling of speed and momentum. Those lines also point us to the stars of the show – the rabbit and the coyote. Kuhn creates a circular design to keep the viewer engaged in the painting by placing some of the strongest color (orange) in the rabbit’s ears which point up to the line of grass and the shrubs that then point to the coyote. The line of the slanting hill and the coyote’s leg and head point to the rabbit – and around and around we go. The rabbit’s feet give us an out if we want it by leaving the right side of the painting, but it is slight compared to the strong upward tilt, contrast and color in the ears that encourage us to stay. Admit it, painting would be boring if it were easy. Sure, paint by numbers were fun when we were kids because they were new, but after a few of them there was no challenge or excitement because each one was essentially the same formula. With painting from life, it is always new and remains challenging and exciting our entire lives. We never fully master painting. (Susie Burns, a Master Oil Painting member, was part of that group). I painted right on the sandy river bank while my young daughter Danni swam and played in the water. Here’s what it looked like. The White River at Morrow’s Meadows – the place I set up to paint. There was so much beauty to choose from. I set up my 40-year-old French easel and then just stood there for a long time taking it all in. Oh, I was anxious to start painting, but I knew if I just jumped right in I would be overwhelmed and get lost in the details. The first step was to decide why I was painting this particular scene. What was it that intrigued or excited me? How could I effectively convey that to my viewers? At first, I thought I might concentrate on the falling sycamore tree reaching across the river. The light hitting on the trunk was very tempting. I also loved the orange leaves and bright thin branches of the small tree to the right that reached out over the water. Finally, I decided that with the time I had, trying to capture the whole scene would not convey the feeling of peace I had at that moment. So, I chose to zoom in on the slanting sunlight and calmer water at the far end of the river (minus the young men enjoying the day). The sycamore was removed because that diagonal created too much activity and energy. Out on location I had painted my primary left trees with the ‘V’ shape you see in the photo. After adding more texture and playing with the light and shadow a bit more in the studio I realized the trees were not working. That ‘V’ shape was too active and did not convey the feeling I wanted. So, I cringed a bit at my lost work, and separated them. I also added the third tree to break up the negative spaces – because it felt like the right thing to do. See how the length of the spaces around each tree is each a bit different. That variety is subtle but crucial to create a greater sense of realism and engagement. Stapleton Kearns refers to that as Inequality of Proportion. The branches on the right with the dead orange leaves were beautiful, but they too offered too much activity. In my painting I used those branches to point the viewer back into the painting but in a subdued way. I purposefully softened most of those branches’ edges and let them dissolve as they moved away from the viewer. Originally my grasses and trees were all shades of green and I only had a small patch of blue sky. With all the green in the water and trees I felt some oranges, reds and yellows would add some needed color balance and harmonize with the lavenders in the shadows. Once I added the warmer colors I added more hints of blues and lavenders all around the painting to subdue those warm tones a bit. Remember, I was going for a peaceful feeling, not high energy. Then I opened up the wall of background trees with more sky but changed the color of the sky from blues to salmons and yellows. I felt that moving the sky color toward the colors in the main trees would tie them together and help clarify the green background trees. For me, each of those decisions, while not specifically thought of in the initial design or composition, contributed to the movement, feeling and unity in the painting. Edgar Payne quoted the art critic John Ruskin ‘the great aim of composition is to create unity’. That’s why I believe that relying too heavily on specific compositional arrangements can distract us. We can become so caught up in finding the perfect formula or theory that we lose sight of the joy of discovery. The changes I made while painting weren’t based on any particular compositional theory. They simply felt like the right thing to do based on the relative influence of everything else in the painting – at that moment. Along the side of my studio in Rye, Colorado a lot of hollyhocks grew in a variety of colors. I loved the way some of them got a blue highlight on the petals when the sun hit just right. I pushed that color, not knowing at the time that there isn’t a true blue-colored hollyhock. Then I placed them in a rocky setting up in the mountains near our home. The hollyhocks themselves were pretty disastrous, but I did like the misty trees in the background and the warm grasses mixed with the cooler lavenders in the rocks. This was completed in the early 2000’s. I never felt settled about the painting and stored it away. I hated just letting it go to waste, especially since it was a 40×30 inch painting. So, in 2011 I pulled it back out and thought about what I liked and didn’t like. The overall design had a good feeling to it. The only thing that really bothered me was the blue hollyhocks. Once I started adding color and energy to the hollyhocks the rest of the painting felt too subdued and quiet. A direct contrast to what I was trying to achieve in Morrow’s Meadow. That’s when I ramped up everything, including the background trees that I liked so much. I darkened the shadow values under the leaves and in the now purple hollyhocks to pull the hollyhocks strongly to the front of the painting. That also allowed me to keep some contrasts in the background rocks and trees without worrying about them pulling in front of the hollyhocks. The orange flowers in the front were completely from my imagination. I simply added enough activity with small leaves and stems to match the vigorous brushstrokes all around the hollyhocks. Compared with the flurry of smaller strokes of color that made up the grasses, leaves and background trees, the hollyhocks themselves almost became a resting place for the viewer. So, while I kept the original basic ‘S’ curve composition from the original, that was an insignificant consideration compared with the feeling of energy I wanted to achieve. The block-in design may have begun with a semi-identifiable composition, but it was the sizes of brushstrokes, the value and color temperature contrasts and the explosion of color that made the significant impact on the feeling in the painting. The main things I looked for were shapes, lines or anything else that might push the viewer out of the painting or demand undue attention. I wanted every part to feel like it belonged and beckoned the viewer to stay. If a rock or a tree didn’t work in one spot I simply moved, discarded or replaced it. It wasn’t the original composition that dictated those decisions, it was the pursuit of unity. Unity among every element that contributed to the dramatic energy in the painting was the goal. Study the theories of composition, but don’t get caught up in them. Let each painting whisper to you what it needs and follow your instincts. Don’t worry about what someone else says is right or wrong, or what conventional wisdom dictates. Take courage and play – try something you’ve never tried before. Your explanation of using design rules complement my style. I break rules each time I paint, and as long as I, the artist, like my interpretation of my subject matter, then I am OK with the result. If I have to paint or design according to strict rules, then painting is no longer fun. My bet is most artists design to their own desires. Thanks for being a hero in my eyes Bill. Happy Painting!! Great post Bill. I remember Stape harping and harping on ” design, design, design”. Its hard sometimes to remember we are not copying nature ( or a photo) but rather our task is to make a pleasing painting- which means designing it. Good to be reminded that these things really do matter …. Oh my gosh- thank you for this article. I had become completely frustrated while reading about composition because, without examples demonstrating the discussion, I wasn’t able to make sense of it all. This is EXACTLY what I needed. I hope you realize what an excellent TEACHER you are in addition to being an excellent artist. Thank you Thank you!! Lately I’ve been so confused about temperature in my paintings. Outdoors–is that cool light [blueish from the sky]?–or warm light [yellow/ orangish from the sun]? Does that leaf have sunlight on it?–and doesn’t it also have sky light when it’s turned up? 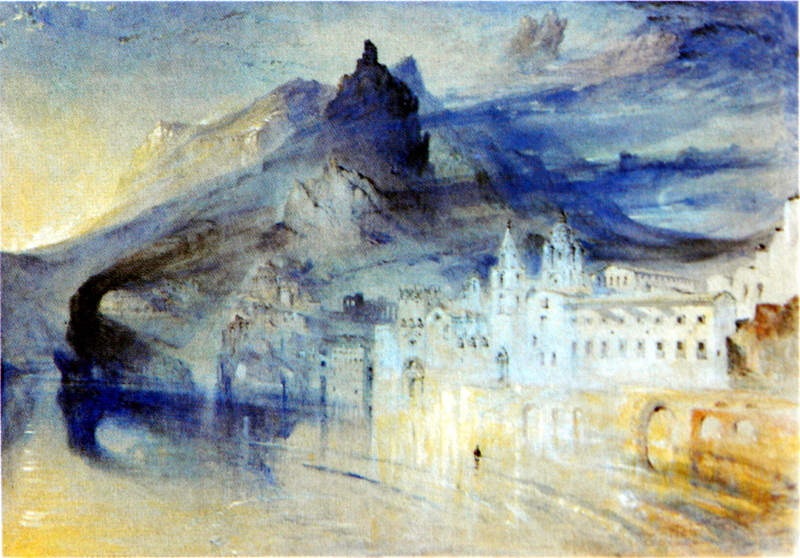 I’ll see warm paintings [like a street in Italy] with cool blue/ purple shadows–is that just pushing the atmospheric color? Most plein aire paintings are under cool light [and even in studio 6500K?] which should indicate warm shadows, but I see more done with cool shadows. Any advice? Also, Ultramarine Blue–cool or warm? You seem to indicate that it is warm, but I’ve always thought of it as cool [Alaska]? and blue-green as warm [Florida]. The color wheel doesn’t really seem to answer that either. Any advice? Help please. Thanks Bill. Very helpful post.